Humans need exercise to feel better, look better and live a healthy life. And the dogs in our lives are no different. Dogs are built for activity. In fact, stray cats and dogs can travel 20 to 30 miles (32 to 48 kilometers) a day. Their domesticated counterparts certainly don't need to cover that much ground every day, but they still need to be regularly moving on all fours. 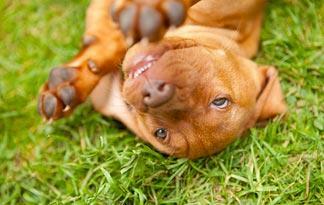 Daily exercise is good for both your pooch's mental and physical well-being. Exercise can help your baby dog avoid arthritis and other problems with his joints later on in life. Dogs are also prone to the same types of obesity-related illnesses as humans, so exercise is crucial to helping them keep off the pounds. Basically, getting your dog in the habit of regular physical activity while he's young is the cornerstone to a long healthy life and helps his physical development. Puppies also need exercise for mental stimulation. Moving around keeps them from becoming bored and mischievous. Many owners find that taking their dogs out for regular outdoor play and walks cuts down on behavioral issues like incessant chewing and digging and nonstop barking that make owners want to pull their hair out. Make sure you're consistent with the amount of exercise your puppy gets. You need to help him build his stamina, and the only way he can do this is by exercising regularly but with caution. At the puppy stage, he's much too young to be doing the rigorous activities that he will be more able to do as he grows older. The amount of exercise your puppy needs depends on his age, breed and medical condition. Not every breed will be up for a long walk through Central Park. Some breeds are just not built to go the distance, while others are always ready to romp. Some of the breeds that need the most exercise are Border collies, Labrador retrievers, Jack Russell terriers and Dalmatians. Puppies need five minutes of exercise per month of age up to twice a day, according to the U.K. Kennel Club. In other words, a 3-month-old puppy will need 15 minutes of exercise while a 4-month-old will need 20 minutes. This may take the form of low-impact activities like swimming or playing with small dog exercise balls. You can also take your puppy out for short walks on a leash. However, if he starts to sit down, give him time to rest. If he does not start walking again, you may have to carry him home. Most adult dogs should participate in some form of physical activity for at least 30 minutes and up to two hours every day. Your puppy's genetics will determine when it's time to move her up to adult dog exercise. If she won't get any larger than 25 pounds (11 kilograms), then she can start at around 9 months. If she'll end up weighing between 25 to 100 pounds (11 to 45 kilograms), it's best to wait until she's at least 14 months old. If she'll be tipping the scale at 100 pounds (45 kilograms) or more, you can introduce these activities to her when she is at least a year and a half old. So, how will your pooch feel after exercising? Pretty much the same as you and I feel after a great workout. Taking your puppy on a nice short walk or letting him play in the yard translates to a calmer canine that will more than likely sleep very well that night.